In a small bowl, mash 2 tablespoons berries. Add ¼ cup broth, brown sugar, vinegar, oil, garlic, ¼ teaspoon paprika and cumin. Place chicken in an 11-in. x 7-in. x 2-in. baking dish coated with cooking spray; pour broth mixture over the top. Sprinkle with thyme, salt, pepper and remaining paprika. Bake, uncovered, at 375° for 20-25 minutes or until chicken juices run clear, basting occasionally with pan juices. Remove chicken and keep warm. Skim fat from pan drippings. In a small saucepan, combine cornstarch and remaining broth until smooth. Gradually stir in drippings. Bring to a boil; cook and stir for 1-2 minutes or until thickened. 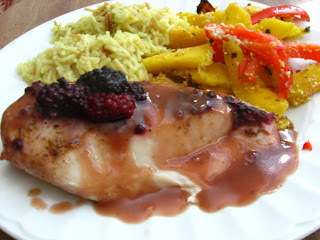 Serve with chicken; sprinkle with remaining blackberries. Yield: 6 servings.